Deena battles the summer heat with a veg-packed salad, utilising the time in the kitchen to spend some quality time with her son, and introduce him to the joys of organic vegetables in the process. 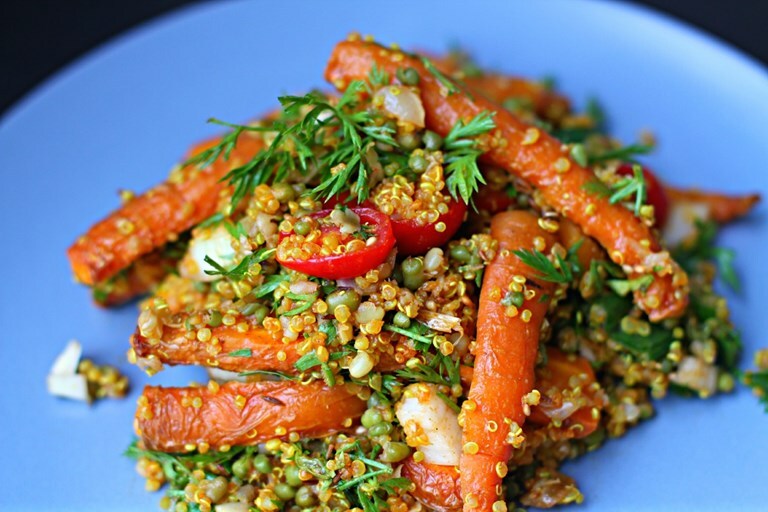 The result is a delicious quinoa salad recipe that's packed with roasted carrots, fresh tomatoes and vibrant spices. It was far too hot to go out today and that’s not something I often say. Unlike my toddler, I don’t much feel like rushing around and the absolute last thing I want to do is stand over bubbling pots of simmering concoctions in this heat. Cue my salad of sweet roasted carrots, nutty pink (paprika- and turmeric-stained) quinoa, refreshing mung beans and juicy tomatoes, wrapped up in an umami-style miso dressing spiked with coriander, cumin, chilli and curry leaves. So, instead of growing irritable in the park with kiddies galore and lugging around drinks, sun cream, hats and changes of clothes... we stayed in and washed mountains of lightly soiled organic vegetables. I stood my boy at the sink and we chatted over the washing of gigantic and crisp lettuce leaves, shiny courgettes, bulbous spring onions, feathery-headed carrots (apparently Rory the rabbit loves them) and even broad beans, which we ate raw. I have to say, the flavours of the vegetables on their own are intense and a reminder that vegetables really don’t have to be just a side dish. The carrots are the star of this dish, just look at them… intense in their wrinkly, roasted skins. A lot of people throw away the feathery greens but for goodness sake, keep them! They add fabulous texture to a salad and unsurprisingly, taste very carroty. This is not posh nosh, but the quality and balance is there and you know, just making this salad with my boy has been an incredibly enjoyable and enriching experience. Deena is a food writer with work published in UK magazines such as BBC Good Food, Delicious, Cook Veg and Fork.